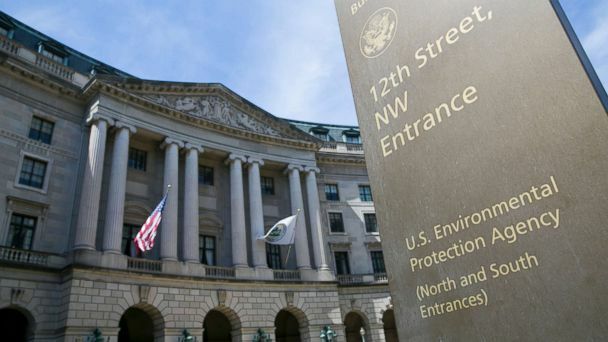 A top government watchdog reported that political appointees at the Environmental Protection Agency delayed reviews of toxic chemicals for months last year during a review to see if the agency's work met the leadership's priorities. Democrats have accused political leadership at the agency of delaying work on chemicals like formaldehyde, which is listed as a probable human carcinogen and found in household products made of compressed wood. The Government Accountability Office report released Monday confirms EPA leadership delayed assessments of toxic chemicals for months in 2018 and ultimately slashed the number of chemicals being assessed after saying they weren't a priority. The Environmental Protection Agency is responsible for examining research of chemicals to determine if they're potentially a threat to people's health and what levels of exposure are considered safe. The GAO says EPA leadership told staff in the program that evaluates the risk of chemicals, known as the Integrated Risk Information System, or IRIS, to hold off on publishing any of their work while they discussed "program priorities." "According to IRIS officials, the IRIS program was unable to release any work since June 2018, while it was waiting for feedback from the Administrator's office regarding whether its assessment work was consistent with agency priorities," the report says, referencing the system used to evaluate chemicals. The EPA acknowledged there was a delay while the agency surveyed offices on the chemicals being assessed but that it would eventually improve the process. "While this action did result in a delay, in the long term, assuring that EPA's program and regional office priorities are being addressed and that each office is fully engaged in the development of IRIS assessments will strengthen the Agency's ability to address its mission of protecting human health and the environment," officials from the agency's chemicals safety and research offices wrote in a response to the report. The EPA said later Monday it conducted the survey to identify which chemical assessments are priorities and instituted a process where the programs identified them. "EPA recognizes the importance of conducting IRIS assessments based on sound science -- and of conducting them in a timely and transparent manner," according to a statement from the EPA. "That's why the Administrator continues to press for improvements in the IRIS program. These improvements have been noted by both the U.S. Government Accountability Office and the National Academy of Sciences. Because IRIS assessments are major investments in both time, historically two or more years per assessment, and resources, it is important to ensure IRIS program activities are addressing the top priorities for the Agency." A different EPA spokesperson told The Wall Street Journal last month that agency officials reportedly disagreed with the Obama administration's policies. "The Trump EPA believes it is using the best available science to determine its proposed rules and regulations, just as the former administration believed it was doing the same thing," agency spokesman James Hewitt said. "However, this administration clearly has huge disagreements with the way the Obama administration carried out the agency's mission." In June 2018, EPA leadership told staff in the chemical office not to release documents related to their work assessing chemicals while they put out a survey to various offices to confirm which chemicals they were interested in. The memo, described in the report and reviewed by ABC News, lists 11 chemicals, including hexavalent chromium, arsenic, PCBs and several types of chemicals known as PFAS, as priorities to be assessed for health risks. After that process, the EPA told staff in a December memo it would pursue research on 11 chemicals, half the amount the office previously worked on, but did not explain how that conclusion was reached. The GAO report also notes that any delay in assessing chemicals can be amplified because staff have to redo some of their work to make sure they don't miss any updates to the research. That list dropped 11 other chemicals, including formaldehyde, and the EPA has not said what will happen to the work already underway for more than a decade and currently listed as ready to be publicly released. Wheeler said that after the review, "Formaldehyde was not listed as a top priority," according to the Democrats' letter. An EPA spokesman did not respond to a request for comment on the current status of the health assessment for formaldehyde. The EPA's website lists the report as ready for public comment but also says "formaldehyde is being reassessed," with no projected date for when it will be made public. In its official response, EPA officials said they met every requirement from the new chemical law passed in 2016 and the program has improved enough to no longer be considered "high risk" by the watchdog agency. Democrats on multiple committees with oversight of EPA wrote to Administrator Andrew Wheeler on Monday, calling for the agency to finish its research on formaldehyde. "Delaying this report only serves to further erode the public trust in the Agency whose mission is to protect human health and the environment," the members wrote in a letter to Wheeler. "We urge you to immediately proceed to review, finalize and publish the formaldehyde health assessment without further delay, new studies, and taxpayer expense." They also want ethics officials to look into whether a political appointee, who agreed to recuse himself from working on health assessments for formaldehyde, had a role in the agency's decision to stop work. David Dunlap, the deputy assistant administrator for research, previously worked at Koch Industries, but documents released by the Democrats show that he was involved in some email exchanges about the work to prioritize which chemicals EPA would evaluate. A spokesman said EPA would respond to the letter through the proper channels. Dunlap did not respond to an emailed request for comment. GAO lists EPA's response to toxic chemicals as one of the areas it's most concerned about within the government and that, even though the agency has improved in many ways, it still needs to improve further. Monday's report notes that the EPA has met several deadlines to improve how it evaluates chemicals, but that there are still concerns about whether the agency has enough resources to meet future deadlines and be transparent about how decisions are made. A draft of the report was first reported by The Wall Street Journal.